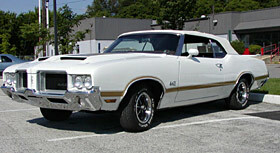 1971 OLDSMOBILE 442, VEHICLE ID: 265, 71 NUMBERS MATCHING CAR,455 ENGINE. 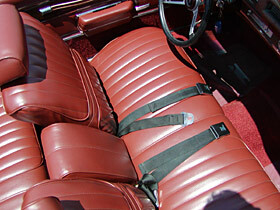 THIS CAR IS A BEAUTIFUL RESTORATION,WHITE WITH 'SIENNA' INTERIOR, ALL NEW.. IT HAS GOLD 'HURST OLDS' STRIPES,COWL INDUCTION HOOD, REAR SPOILER (WING)...THE INTERIOR IS COMPLETLY RESTORED, IT LOOKS LIKE IT ROLLED OFF THE SHOWROOM FLOOR !! 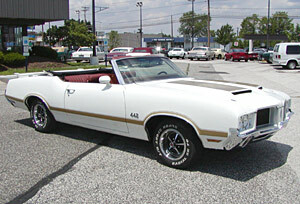 THIS CAR IS A GREAT EXAMPLE OF A 70'S MUSCLE CAR WITH GREAT INVESTMENT POTENTIAL!!! !